St Peter's Church is at the centre of the parish and village of Burnham, 3 miles west of Slough and 3 miles east of Maidenhead. The parish contains both rural and urban environments and is served by two local authorities, South Bucks District Council and Slough Borough Council. It is an inclusive Church in the middle Anglo Catholic Tradition. St Peter's Church proclaims the good news of Jesus in Word and Sacraments and are a friendly Christian witness in our local community. 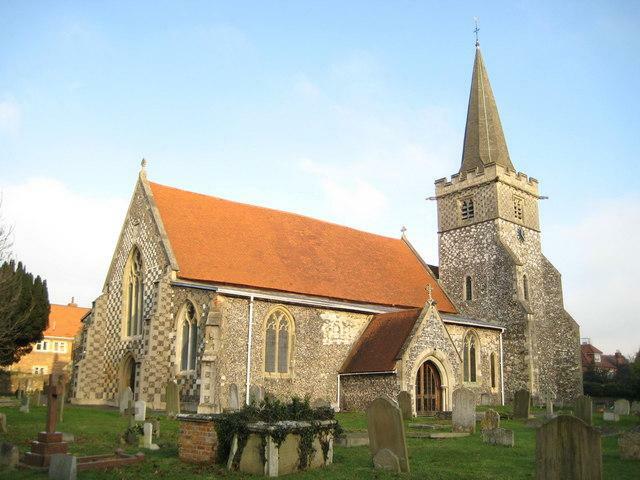 The Parish Church of Bumham has played an important part in the history of this locality for over a thousand years. Burnham was mentioned in the Doomsday Book (1086) and forms part of the Chiltern Hundreds, which comprise Burnham, Desborough and Stoke. The first church on this site was probably built by the Romans in about 500 AD. Some early references to Burnham are to be found in the registers of the Bishops of Lincoln as Burnham was in this Diocese until the formation of the Diocese of Oxford in 1835. It is likely that the Saxons replaced the Roman church in about 700. The Saxon Archbishop Aelfric refers in his will to lands in Burnham. It is probable that the present building was started in the reign of Stephen (1134-54). King John presented the earliest known incumbent to the Rectory of Burnham in 1202. Various additions and improvements have been made to the building over the centuries. A major restoration was carried out in 1863-4 under the supervision of the vicar, the Revd. Thomas Carter, and churchwarden, Mr Samuel Christie-Miller. The very considerable sum, at that time, of £2,000 was raised by public subscription. The work undertaken included removal of the ceiling and a gallery, restoration of windows, provision of a heating system, and an oak floor. The south porch was rebuilt and Minton tiles laid in the chancel. The chancel walls were also strengthened by the addition of five buttresses. In 1891 a second restoration took place. The £3,018 raised, again by public subscription, was mostly spent on the tower. A masonry storey, replacing the former wooden structure which had housed the bells, and a timber spire covered in oak shingles were added, together with a new turret staircase. The stonework of the west window was also entirely renewed and a vestry built. In 1897 two treble bells were added to commemorate Queen Victoria's Diamond Jubilee. In 1949 the bells, some dating from the 15th century, were recast and re-hung in a new steel frame. Other major restoration work was carried out in the 1960s, when new flooring was laid and an electronic organ installed. In 1986 the vestry was demolished and the present Cornerstone built. Church members met the cost of £120,000 from legacies, mainly from the Almond and Rhodes families, through public donations and fund raising activities. In December 2003 the restoration of the Reredos began and was completed in time for Easter 2004. The Reredos is a marble and alabaster carving depicting the healing scenes from the life of Jesus. Funds for this restoration were kindly donated by the English Heritage Trust and the National Lottery. During the cold winter period of 2009-10, the aging boilers which heat the church failed and were beyond economic repair. Following appeals and many fund raising activities, the sum of £19,000 was raised over a five week period and two months after the old boilers failed new units were installed allowing the church to be used fully once again. If you would like to know more about about the history of St Peter's or indeed Burnham Village, please contact the Burnham Historians.